Here you can watch how to use our products and have all your questions answered. How do I apply FRONTLINE PLUS and FRONTLINE SPRAY? FRONTLINE PLUS and FRONTLINE SPRAY are simple to apply. Review the directions on the product label or watch our videos to see how easy it is to keep your pet free of fleas and ticks. How often should I use FRONTLINE PLUS? Treat all your dogs and cats every month for optimal flea control. 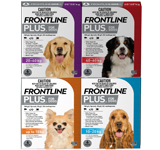 When applied correctly, FRONTLINE PLUS remains active against fleas for at least one month. If you are in a paralysis tick area, apply FRONTLINE PLUS every 2 weeks to provide paralysis tick control for your dog. If you are in a paralysis tick area and have a cat, apply FRONTLINE SPRAY every 3 weeks for protection against paralysis ticks. Yes. FRONTLINE PLUS is water-fast. 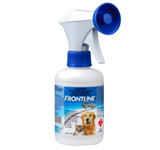 It is OK to bathe your pet before using FRONTLINE PLUS, but the coat should be completely dry prior to application. In the 48 hours immediately after treatment, do not bath, shampoo or let your dog go swimming. Cats can be bathed from 24 hours after treatment. Is FRONTLINE PLUS a flea repellent? No. 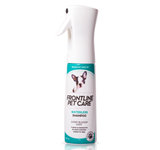 FRONTLINE PLUS is a flea treatment that affects fleas when they are exposed to the active ingredient on your pet's coat. Unfortunately, there is no product on the market that effectively repels fleas or kills fleas instantly. Fleas have to jump onto treated pets to come in contact with the active ingredient regardless of which flea control product is used, and all products take a period of time to kill those fleas. How can fleas affect my pet? Fleas can cause irritation, anaemia (loss of blood caused by bites) and an allergic skin condition called flea allergy dermatitis, or FAD. Signs of FAD include severe itching, hair loss and skin sores affecting the skin of the back towards the tail, the rump, thighs and perianal area.